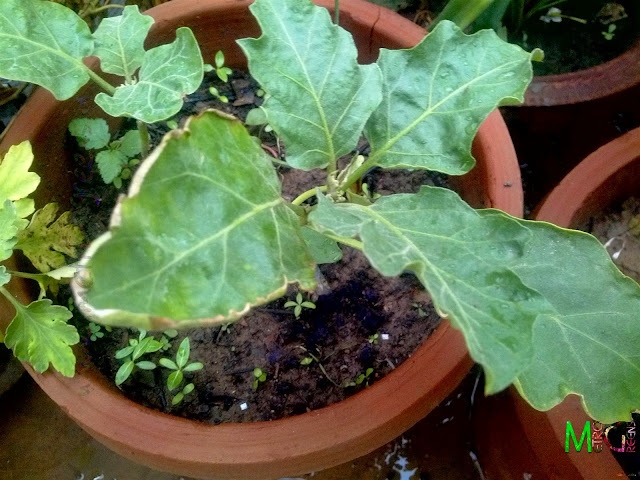 A while back, - a month and a half to be precise, I got some eggplant saplings to be planted in some of the pots in my rooftop garden. 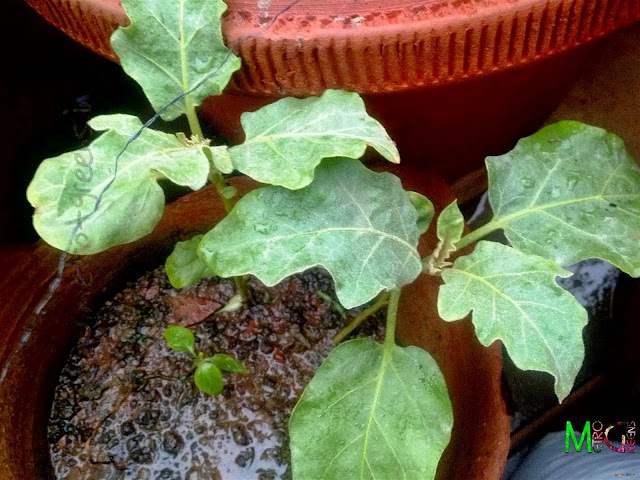 This, by far, is my first attempt at trying to grow eggplants in my pots. 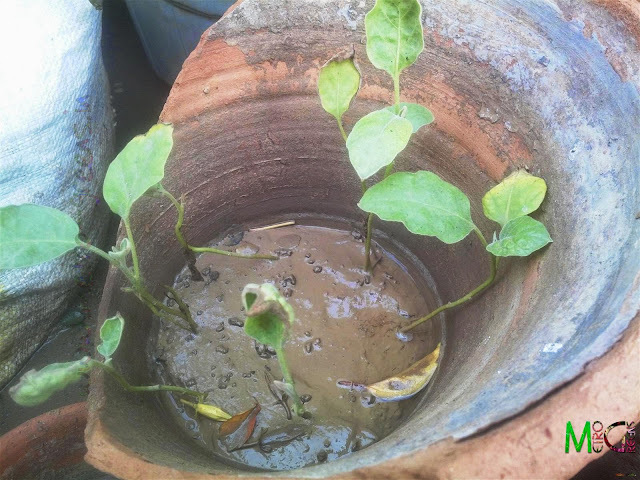 I have experimented with some beans, chillies, fennel, coriander, mint, bitter and ridge gourd, tomatoes and even pumpkins (okay, that was a small one ) to name a few, but, this is the first time, I have planted eggplants. 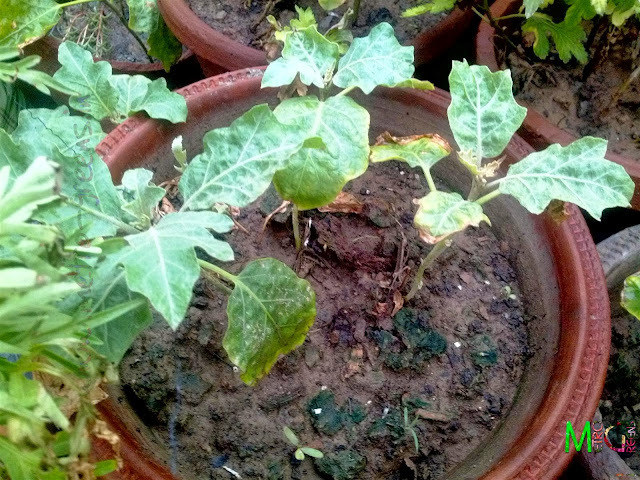 My mother has been asking me to get eggplant saplings, but, not sure of its success in small pots, I always ignored. So, coming back to the eggplant story, which, doesn't count as one of my favourite vegetables on the platter, is known to be a low fuss plant, when it comes to the care it needs. Eggplants come in a variety of colours and shapes ranging from the traditional dark purple (that looks almost black), to green and white, and yes, it comes in textures too. Shapes and sizes range from very small to large sized globules, ranging from a few grams to more than a kilogram, and larger, at times, which, atleast, I've seen in dark purple colours only. 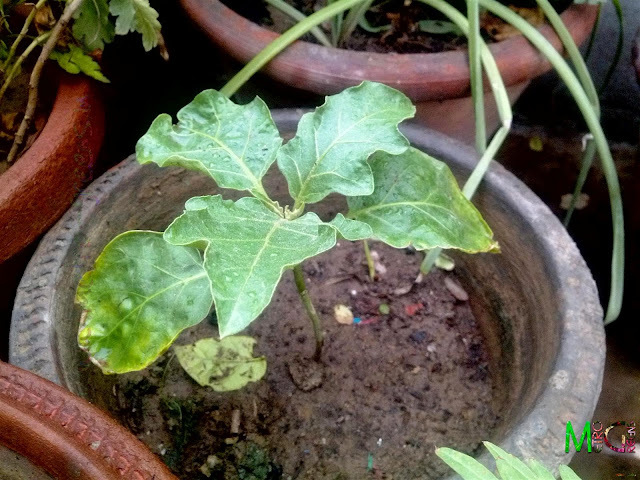 There are some elongated varieties, looking very much similar to small calabash (the long one), only to be differentiated by the crown shaped extension of the stem on the eggplant fruits. 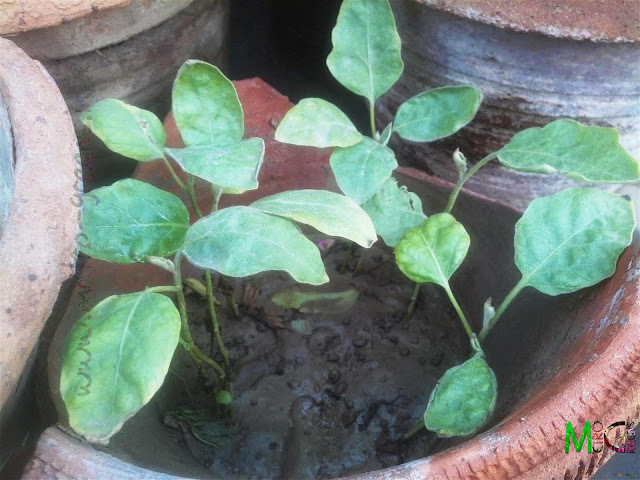 The eggplant saplings, which, I planted in some unused broken pots, to allow them acclimatize to the new soil and conditions, have since been transferred to individual pots, and most of them seem to be doing pretty well. As with my usual gardening technique, I have been staying away from chemical fertilizers, and totally dependent upon the vermi-compost to fulfil all my plant's nutrient needs. Hopefully, I will soon be harvesting a few eggplants, and whenever that happens, I will be sharing the results with you all too, Promise . Upcoming posts will be seeing some blooms, atleast, for now, I can vouch for the tuberoses, as the monsoon season has finally arrived here. Till then, HAPPY GARDENING!